When we violate the laws of God, it is called sin. As the proportion of sins increases, suffering increases. Our inherent nature is to remain happy. No one wants unhappiness. But due to the stock of our past and present sins, we are forced to suffer. This suffering can be stopped by chanting Hare Krishna because the holy name of God has the power to destroy our sins. Therefore you find the Hare Krishna devotees chanting the holy name of God on the streets around the world. The passersby, even if they unknowingly hear the holy name of Krishna, they get immense spiritual benefit. Even trees, birds and animals get benefitted by hearing the transcendental sound vibration of Hare Krishna. Chanting wont help, it is good when we afraid. But we have to meditate to attain the supreme which mean we have attain yogic state where we feel life air on top of your head in our heart(8.12) where we feel the presence of Almighty. This is the stage where we attain our self realization and here we enter into the kingdom of God. We realized that the whole Universe is within us and our body is a temple and all the Gods, Goddess, Prophets & their incarnations in all religion exist within us and has come to help us to liberate. We already had taken so many birth, now the time has come to attain Supreme who is eagerly waiting for our response. Divine Power has inbuilt all the arrangement within us and he is eagerly waiting for our positive attitude to receive the same. Unless and until we don’t get self-realized we will only get engaged in flowery words which is already mentioned in all Holy books which we have made habit of blindly reading the prescription instead of attaining that state of realization. Meditation is an individual journey to collective & bliss. All of the above knowledge and wisdom about God is priceless & absolutely free. It is the happening within and if anyone want there self-realization please call me on 9820027877. Just as, for every season we have different types clothing, similarly for every age the process of self-realization is different. The clothing, which you wear during the winter season, cannot be worn in the summer. Similarly, the process of meditation, which is meant for the satya yuga, cannot be practiced in the present age of kali. The process of eight-fold yoga, or meditation, was summarily rejected by Arjuna as impractical. Therefore Krishna gave him a better process of surrender through the chanting of the holy names. You have mentioned, “Unless and until we don’t get self-realized we will only get engaged in flowery words…” What makes you think that those who are chanting the holy names, are not self-realized? “The members of the Kṛṣṇa consciousness movement are not at all interested in so-called meditation in the Himalayas or the forest, where one will only make a show of meditation, nor are they interested in opening many schools for yoga and meditation in the cities. “Rather, every member of the Kṛṣṇa consciousness movement is interested in going door to door to try to convince people about the teachings of Bhagavad-gītā As It Is, the teachings of Lord Caitanya. That is the purpose of the Hare Kṛṣṇa movement. Subscribe to The Hare Krishna Revolution. It's Free! 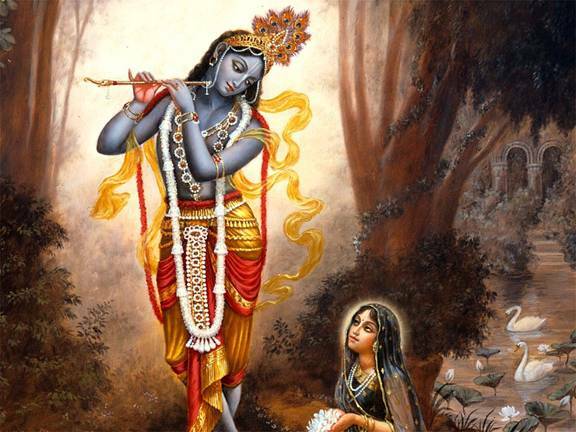 What if Muslims or Christians deny to chant the name of Krishna? WHY IS LORD BUDDHA CALLED ATHEIST? How Tamaal Krishna Stopped Smoking Cigarettes? Krishna, the Supreme Personality of Godhead being worshiped by Lord Brahma, the demigod who creates the universe. WHO IS THE GREATEST - BRAHMA, VISHNU OR SHIVA? Why does ISKCON say Lord Krishna is the Supreme God when we know that Lord Shiva is Supreme? Srimati Radharani on Why does ISKCON say Lord Krishna is the Supreme God when we know that Lord Shiva is Supreme? Shiva on WHO IS THE GREATEST – BRAHMA, VISHNU OR SHIVA?